As I mentioned in one of my earlier posts, front gardens are predominantly functional spaces which means that there are things to accommodate that you don’t necessarily want to look at. Rubbish bins are an eye sore, especially the wheelie variety and in most areas home owners have at least two to accommodate. If you’re lucky enough to have space at the side of the house to tuck them away out of sight that’s great, but often there’s no choice but to store them in the front garden. 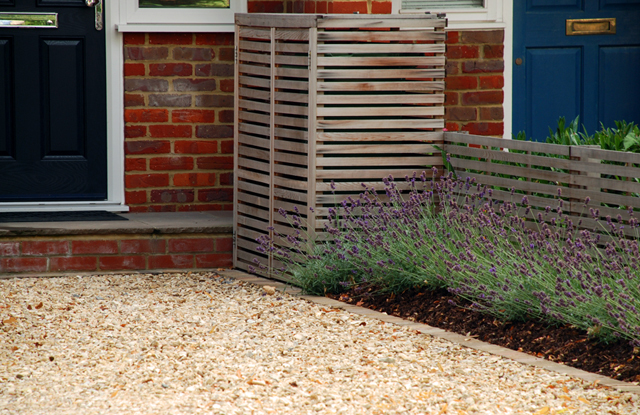 However pretty and well designed your garden, there’s no getting away from the fact that rubbish bins are unsightly so ideally you want to be able to screen them away. 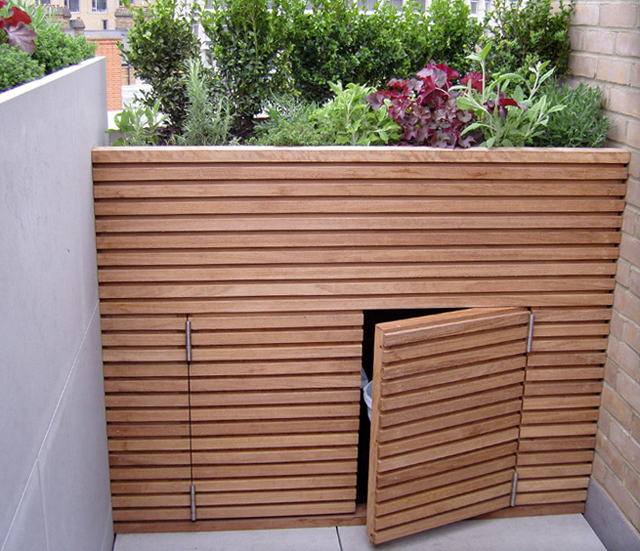 This could be behind a trellis with climbers or in a designated part of the garage, but if neither of these options will do, why not look at some kind of storage unit. There are many “off the shelf” options available but the cheaper examples can be a bit shabby so it depends how fussy you are about the final look. 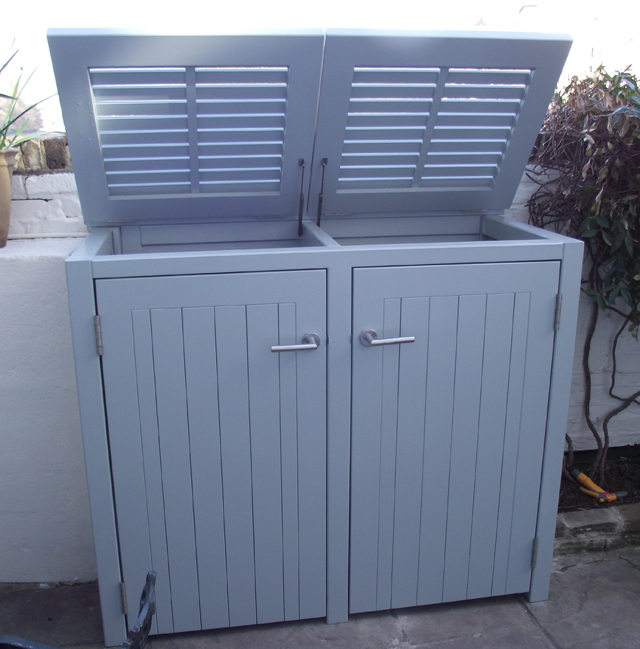 Bespoke bin stores can be pricey, but the difference it will make to the overall look and feel of your garden may well outweigh the cost. The Garden Trellis Company are a good reference point (see link below) but I’m sure you’ll have a local joiner that would be able to build you something to fit. Alternatively, you could work with your landscaper to build something as they often work with joiners and/or carry out joinery work themselves. 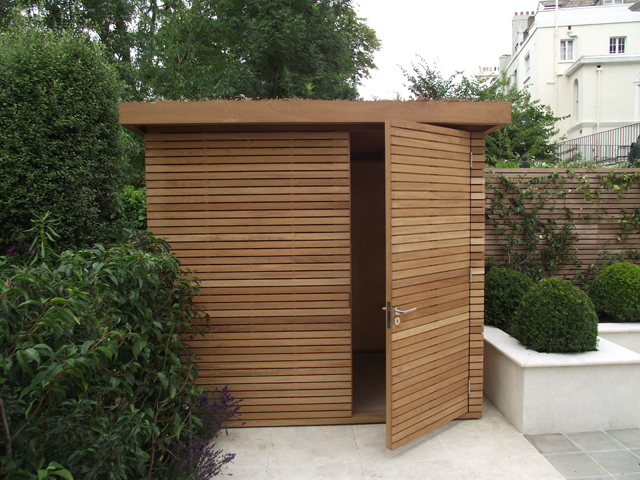 The simple bin store above was built by my local joiner, Rob Horton, but I know my landscaper has subsequently used contemporary trellis kits from Silva Timber to make up his own, relatively inexpensively. 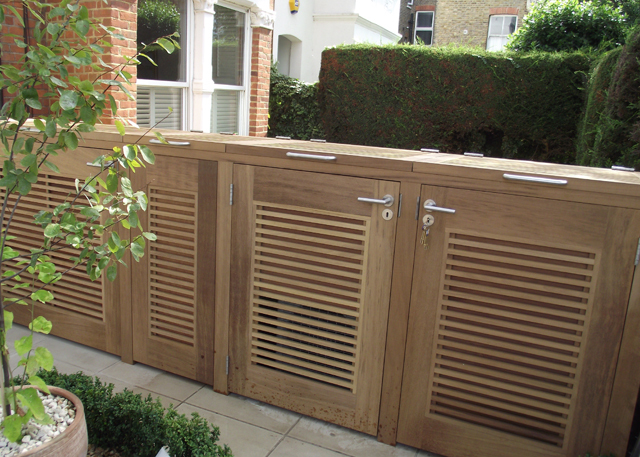 Other storage for the front garden might include a lockable space for bikes, other items that you don’t want out on show or a space to store your logs. 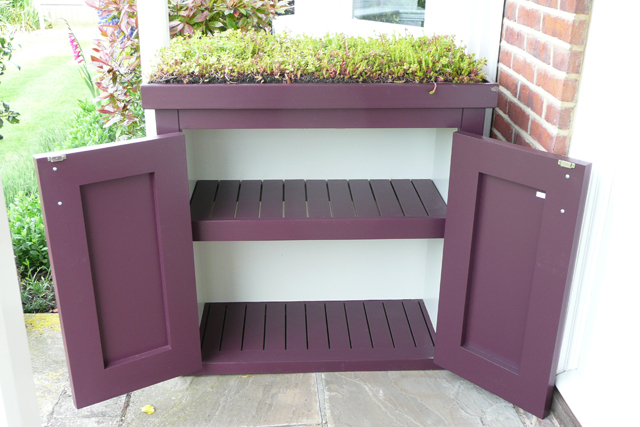 These are available off the shelf in timber or metal but, again, if you want something a bit more stylish then you can work with a joiner to make you something that fits. Hello Lesley, I suggest you contact The Garden Trellis Company directly http://gardentrellis.co.uk/ – they’ll be able to help you! Who made the blue bin store (third image from the top) or is it off the shelf?